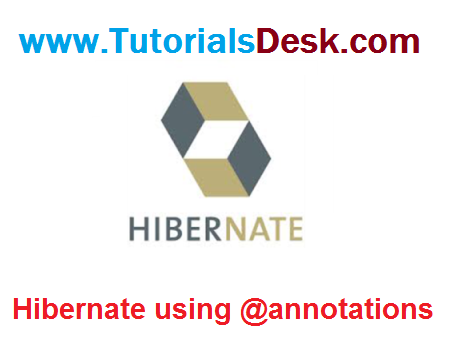 The hibernate application can be created with annotation. There are many annotations that can be used to create hibernate application such as @Entity, @Id, @Table etc. Hibernate Annotations are based on the JPA 2 specification and supports all the features. All the JPA annotations are defined in the javax.persistence. * package. Hibernate EntityManager implements the interfaces and life cycle defined by the JPA specification. The core advantage of using hibernate annotation is that you don't need to create mapping (hbm) file. Here, hibernate annotations are used to provide the meta data. It is a configuration file, containing informations about the database and mapping file. put this file under root folder. This is a simple pojo consisting of an Student object, we will map this class to relational database using hibernate utilities. @Entity annotation marks this class as an entity. @Table annotation specifies the table name where data of this entity is to be persisted. If you don't use @Table annotation, hibernate will use the class name as the table name bydefault. @Id annotation marks the identifier for this entity. @Column annotation specifies the details of the column for this property or field. If @Column annotation is not specified, property name will be used as the column name bydefault. Follow us on social media to get latest tutorials, tips and tricks on Hibernate.